Nothing is quite as thrilling as watching your Arabian racehorse in the home stretch speeding neck and neck toward the finish line to a photo finish. Or… maybe it’s you standing proudly in the winner’s circle with your majestic horse at your side as the track photographer commemorates your win. Either way, the thrill of horse racing and the thrill of wining are both feelings that you won’t soon forget! The excitement of Arabian racing is undeniable, but the question is how can you get involved and who can provide you with the help that every beginner needs so that racing will be an enjoyable and worthwhile experience? The answer is the Arabian Jockey Club. 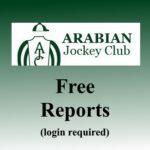 The AJC can lend a helpful, knowledgeable hand as you enter the starting gate to Arabian racing. Racing is not an exclusive sport either. Arabian owners are finding that the athleticism and beauty of a racehorse can lead to success in the show arena and distance riding as well as on the track. Arabian racing is a sport that promises to continue its drive to the finish line. Pure-bred Arabians can be found racing on all continents. International competition has expanded with many internationally sponsored Arabian races here in the USA. It’s the perfect time to get involved and the AJC is here to help put you on the right track! When you’re new to Arabian racing, where to go and what to do can be an overwhelming challenge. Wouldn’t it be great to have an experienced racehorse owner help lead you down the path to the winner’s circle? That’s the basic idea behind the AJC’s Mentor Program—which was set up to pair newcomers with successful, existing owners. The main goal of the mentor program is to educate and advise new owners to make them feel comfortable in Arabian racing. Anyone becoming involved in Arabian racing can get a mentor in their area. All it takes is a call to the AJC and the new owner, or potential owner, will be connected with an appropriate mentor. The relationship and level of involvement is up to the individuals. This program is always looking for existing owners to volunteer as mentors. If you are an Arabian race horse owner, and would like to share your experience with a new owner, just contact the AJC.